On 28th January 1457, thirteen year-old Margaret Beaufort gave birth to a son at Pembroke Castle, West Wales. The infant was named Henry after his half-uncle Henry VI. Henry’s father Edmund Tudor, 1st Earl of Richmond, had died from the plague three months earlier (while imprisoned by Yorkists) so his mother had been taken in by her brother-in-law, Jasper Tudor, Earl of Pembroke. Henry’s paternal grandparents were Owen Tudor, a former page to Henry V, and his wife, Catherine of Valois, the widow of Henry V and mother of Henry VI. His maternal grandfather was John Beaufort, 1st Duke of Somerset, and his maternal great-grandfather (John Beaufort, 1st Earl of Somerset) was a son of John of Gaunt, 1st Duke of Lancaster, and his mistress (and later wife), Katherine Swynford. It was from this Beaufort side of the family that Henry VII derived his claim to the throne. So, we could have had a King Owen instead! 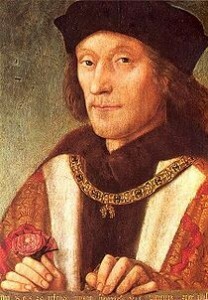 Following the deaths of Henry VI and his son, Edward, Prince of Wales, in 1471, Henry Tudor became the senior Lancastrian claimant to the throne. After Richard III took the throne in 1483, Henry decided to stake his claim. On Christmas Day 1483, in Rennes Cathedral, France, the exiled Henry pledged to marry Elizabeth of York (daughter of the late Yorkist King, Edward IV, and the sister of the Princes in the Tower), thus gaining more support for his claim to the English throne. His descent from Rhys ap Gruffydd, the Lord Rhys, also gave him valuable Welsh support. Securing the throne and passing his crown unchallenged on to his son and heir, Henry VIII. Uniting the kingdom and bringing peace to England after decades of unrest. His reform of administration – e.g. The setting up of the Court of the Star Chamber. First what a weird coincidence that Henry Viii died on the same date his father was born. I am not convinced that Henry Tudor was a son of prophecy, the Welsh Bards did a good job of beaffing him and his family up to boost and celebrate his cause. Having said that, the many fortunes and happy accidents, the heroic belief of his mother, and the support of Jasper Tudor, must have made it seem that he was blessed with a Destiny to rule. His cause was helped by the apparent propensity for the House of York to implode. The sons of York turning on each other while Jasper and Henry were in exile, the execution of Clarence, the premature death first of Edward IV, then the vanishing Princes, plus the death of the ten year old Edward, son of Richard lll, all in a short few years must have seemed as if the heavens had intervened. By 1484, only one full adult DIRECT male of royal blood stood in Henry Tudors path, Richard lll. married to the true York heiress, Elizabeth daughter of Edward IV, whom he would ‘re legitimize, then they would be pushed aside once he had a son, and could be controlled or illuminated. In the case of Warwick and John Earl of Lincoln he did both. Henry knew that the throne could be won by killing Richard but had to be kept, which is why he married Elizabeth of York. His victory over Richard, the defections to his cause, the death of Richard, a more experienced warrior, all enforced the belief that Henry Tudor was born to rule. His claim to the throne was via an illegitimate line, previously excluded from the throne by Parliament, even though they were legitimized. His mother and father could claim to be legitimate, although the marriage of his grandparents is questionable. His mother, however, has a royal pedigree on both sides. The claims of the man he replaced are still held as superior, and Henry needed to marry the daughter of Richard lll brother Edward IV in order to secure his own claim. His kingship won on the field of battle makes the Yorkist claim mute. However Henry was not a fool, not only did he secure his cause by marriage, he placed the other heirs in closely guarded guilded cages. Edward of Warwick was first placed in the care of his mother, Lincoln made his peace and recent article suggests that Henry was willing to accept him as his heir until the queen had a son. The former was later beheaded after being housed in the Tower for several years, and Lincoln supported the Dublin King, known to history as Lambert Simnel, but crowned as Edward Vi in Dublin in 1486. Lincoln was killed at Stoke Field 1487. In 1486 Henry Tudor and Elizabeth of York were married, their heir, Arthur being born that same year. The more famous son, the future Henry Viii, was born in July 1491. The victory over more rivals in 1486 must have given the bards even more reason to laud the coming of the Tudors. The reality as history has shown was far from the glory and hope that prophecy claimed. Bit of trivia, Owen Tudor was really named Meredith. Is it true that Margaret Beaufort protested against her granddaughters being married at the young age she had been? I’ve heard this, but I don’t know the source. She must have been a truly remarkable person, to persevere as she did throughout her life. Why is there no mention of him having to escape ,via Tenby, to France, before coming back to concour KIng Richard. It was just mean to be a very brief overview, not a detailed one, so I haven’t gone into detail about him leaving England, his exile in France etc. However, Debra Bayani’s biography of Jasper Tudor is very detailed and is an excellent read. Margaret Beaufort was very lucky to live as well as her son, Henry Tudor, as she was so young, thirteen, but it was dangerous to give birth at any age, particularly for such a young girl. When you think Henry spent fourteen years in exile, was left on a battlefield, was almost kidnapped, it must have seemed that he was indeed blessed to win Richard’s throne. Henry Tudor did not have popular support, he had to trust in a few Lancastrian supporters, disaffected gentry, a bunch of Flemish and French prisoners, sell swords, a few disaffected Yorkists, plus once he landed, Welsh allies. He couldn’t know if the Stanley army was his, nor was it until the last moment..but with their treason, he won his crown. The lawful King, Richard was usurped by force of arms and killed by blows to his head, while fighting to the death on Bosworth field. Henry, however, via his marriage, quite a bit of spin from a bit of poetry and dragon banners, through rewriting the history of his line, managed, against opposition to settle the land as King and found a new dynasty. Through all of his travails his mother had hung onto the hope that he would be King. It was possibly seen as s miracle that he was. Henry was a wise and patient and cautious King. He knew the value of good service and talent. He kept Surrey, son of Norfolk, who had died at Bosworth, true to Richard in the Tower, but after a few years, let him out to help keep order. Henry was able to control the old nobility, he defeated pretenders and he kept his promise to marry and Elizabeth. First he had to reverse her illegitimate status, but they appear to have been happy and she was a successful mother, wife and Queen. Although Henry saw to the malicious backening of Richard iii, it is also now believed that Henry also got a bad press, overlooked by the spectacular reign of his son..Henry Viii. “Judge me, O Lord, and favour my cause.” Those words give me chills; Henry VII had such a steel-strong mother who promoted him, and was himself fearless, determined and driven. To me, he is the ultimate Tudor, with his granddaughter Elizabeth I a close second.